Fighting Knights Templar Swords for sale are 39 inches in all. These swords feature a display ready stainless steel blade and include a free wooden display plaque. The mirror polished 30 ½ inch blade features a factory edge on both sides. The metal wheel pommel in engraved with the famous red cross of the Order of the Templar Knights. The straight metal guard is engraved with three more red crosses. The grip is covered in brown leather with a gold wire wrap. The free wooden display plaque features a pattern of two golden horse heads. These swords also include a free laser etching. Personalize this sword and etch up to 60 characters. 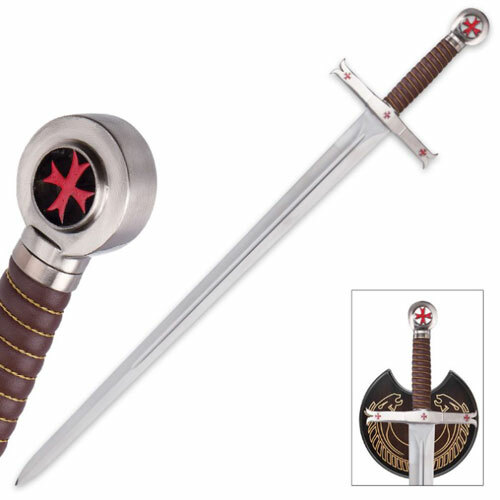 Buy the Fighting Knights Templar Sword for only $89.99.